Hi Prateek. How was the bargain for CAT material? I am interested in the UPSC material and want an idea on the bargaining. I know its tight but if you could help with a general guideline from your experience. 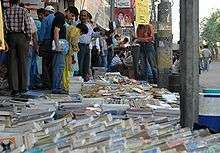 And also, I remember from around 5 years back, the academic book vendors were clustered at one corner. Still the same? Thanks for your blog. Good job. Not much.. It was around 10-15% of the price he said. Had it been a novel you could have easily got 50-60% off. Sometimes 90%+ off. Its still the same you will find the academic book vendors around the one side, and other book vendors on other side of road. Can I got a complete package for CAT prep. in Daryaganj like CL & TIME coaching. Which one is best coaching package in your opinion. I believe Time has more exhaustive set of problems as against CL for CAT preparation. Previous Previous post: On the Move! Next Next post: Economic Meltdown and Me..